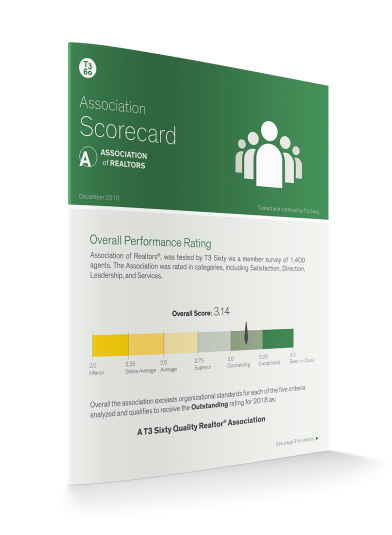 T3 offers standardized Performance Scorecards and Reports for Associations and MLSs. As an Association and MLS leader, you constantly face many challenges. Get meaningful information, insights, and strategies to intelligently benchmark your organization. The T3 Performance Scorecard grades organizations on a four-point system and can be delivered in 30 days. How do T3 Performance Scorecards and Reports work? All members/subscribers are asked to complete an association or MLS specific performance survey comprised of questions in five key performance areas. Up to 5 custom questions can be added. T3 Sixty administers the data gathering process to increase response rates, maintain integrity, determine benchmarking and timely completion of the process. Following the completion of the survey, T3 Sixty generates a two-page scorecard with your overall performance score on the first page and scoring for each of the 5 key areas of performance on the second page. This T3 Performance Scorecard is suitable for publication to members as an educational tool and resource to demonstrate your organization’s focus on measurement and improvement. The Performance Scorecard is then integrated into T3 Report which includes charts and graphs, sample comments, respondent demographic profiles, year over year comparables, and up to five recommended Improvement Priorities and planning document that can be utilized by organizations for implementation purposes. Generation of the T3 Scorecard is followed with a remote presentation (60 minutes) that can be used at the organization’s discretion for leadership and educational purposes. All organizations commissioning a T3 Scorecard will also receive a complimentary copy of the T3 Scorecard Annual Benchmark Report, generated in the fourth quarter of each year based on overall performance scoring of participating organizations (organizations not identified separately). What's it like working with T3 Sixty? As an Association and MLS leader, you face many challenges and a changing environment. Get the information, insights, and strategies necessary to intelligently improve your organization. Intelligently transform your organization into a best-in-class association or MLS. © 2019 T3 Sixty, LLC | Association/MLS Scorecards are a product of T3 Sixty. All rights reserved.